Host your Event at HealthWorks! HealthWorks! is great for a variety of facility rentals for special events! From corporate board meetings to educational training and team building activities, HW! provides a unique option for groups looking for a place to hold their next meeting. 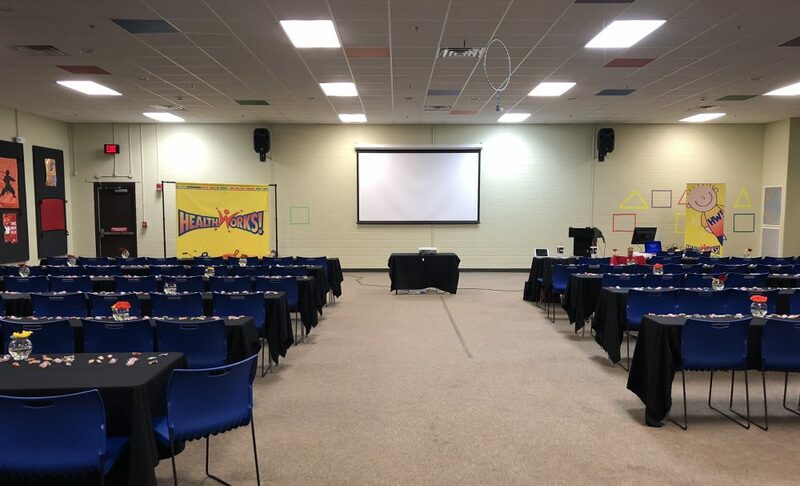 Zoom Room: The Zoom Room is the most popular space for facility rentals. The 2,000-square-foot multi-purpose room can be used as desired. This is where HealthWorks! hosts most birthday parties, but it has also be set up for physical play and for a 100-person conference. The room also features a large projector screen and audio/visual equipment. Tables and chairs provided by HealthWorks! Tables and chairs were rented for event and delivered to/setup at HealthWorks! Great for smaller groups and meetings! Classrooms: HealthWorks! has two classrooms available for rent. These are ideal for smaller groups for a shorter amount of time. Classrooms feature audio/visual equipment, dry erase board, and riser-style seating. Classrsooms also serve as a great space for “breakout sessions” if the main meeting is in the Zoom Room. Classroom used as adults attend a lunch and learn. All facility rental attendees have access to the Funtastic Floor, however, there may be other visitors playing while your group is here.